The heroes and villains of Star Wars travel from one side of the galaxy to the other in freighters, cruisers, and starfighters, but they are not typical in their world. The average citizens of the Republic and the Empire do not own their own starships or make the jump to lightspeed on a daily basis. 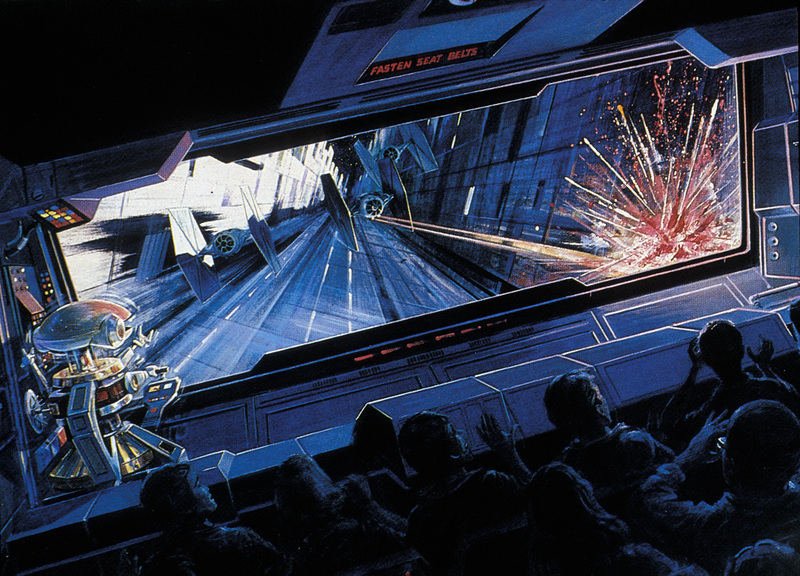 Their side of the galaxy was largely unexplored until the debut of the Star Tours theme park attraction at Disneyland in 1987. It would subsequently open at Tokyo Disneyland, Disney-MGM Studios (now Disney’s Hollywood Studios) in Florida, and finally Disneyland Paris. In 2011 a new 3D version of the ride — actually a prequel to the first attraction — opened in Florida and California. The new attraction now randomly shuffles a number of scenes, allowing for the equivalent of 54 different adventures for visitors to experience. The new ride most recently debuted at Tokyo Disneyland in May of 2013. How do the normal citizens of the Star Wars galaxy travel? Not very different than we do, it turns out. Travelers stand in a long queue while safety announcements and advertisements blare overhead, and are then herded into a cramped cabin where they sit shoulder to shoulder with their fellow passengers. Though air travel is often referred to as the safest way to travel here on Earth, guests arriving in the Star Tours terminal should expect a more dangerous situation, especially when greeted by the sight of two famous droids who excel at getting into trouble. 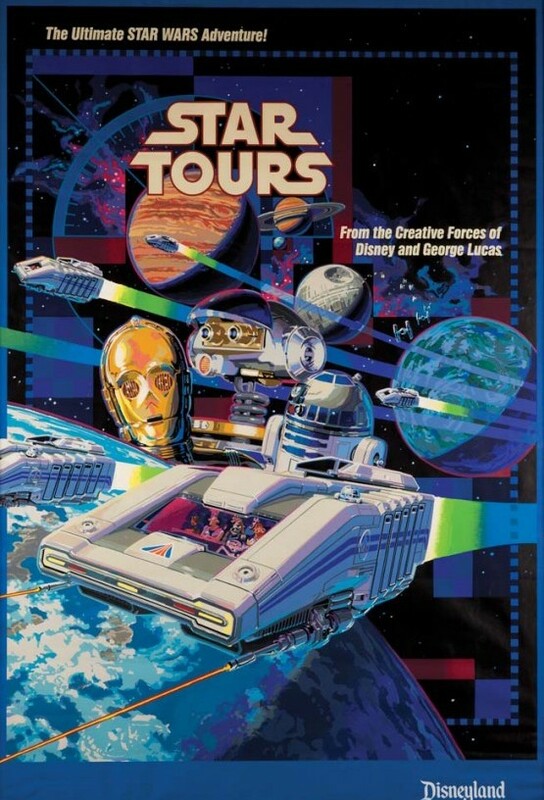 The Star Tours travel agency existed as far back as the Clone Wars, but new ownership re-launched the company about a year before the Battle of Yavin with the aspiration of preserving unrestricted space travel while the Empire was tightening its grip on the galaxy. Star Tours opened a new terminal on Spaceport THX1138 in the Earth system, along with other members of the Galactic Tourist Bureau (GTB): Air Alderaan, Bespin Direct, Dantooine Express, Naboo Spacelines and Tatooine Transit. The members of the GTB were provided with droids and security systems by Sacul Industries Group. 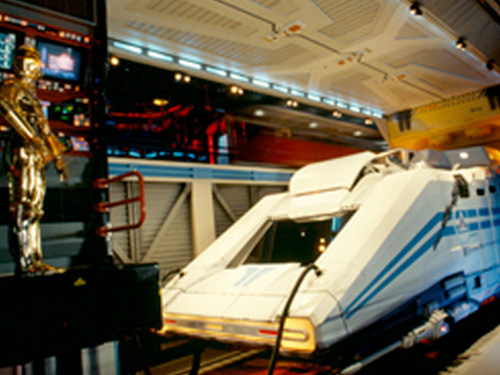 Though Star Tours claimed to be the exclusive user of the StarSpeeder 1000, the other GTB members all used variations of the forty-passenger spaceliner designed by Sacul Aerospace. At the time of its new beginning, Star Tours traveled to more than thirty destinations. Prior to the company’s inaugural flight, Star Tours gained the support of Alderaanian Captain Raymus Antilles. As captain of the Corellian Corvette Tantive IV, Antilles served Senator Bail Organa and, like Organa, was secretly a member of the Rebel Alliance. To assist in the preparations for the first flight from Spaceport THX1138, Antilles assigned droids C-3PO and R2-D2 to temporarily work for Star Tours. Even at the beginning, signs of the mismanagement that would eventually lead to the travel agency’s demise were evident. On the morning of that first flight, the droids could be seen repairing a StarSpeeder in clear view of arriving passengers, while ramps leading through the terminal took guests past droids in various states of disrepair, including a batch of defective RX-Series pilot droids set to be returned to the manufacturer, sitting inside opened shipping crates. Despite the defective droids, Star Tours continued its plans with newer AC series pilot droids. Around 0700 hours on that first morning, final preparations were being made for Flight 1401 bound for Coruscant, with AC-38 as pilot and R2-D2 serving as the StarSpeeder’s navigator. AC-38 left the cockpit to give C-3PO space to repair a faulty binary motivator, but the ship was elevated to the passenger loading level before the pilot returned. Guests boarded the vessel, and an automated launch sequence was initiated while Threepio tried to explain to flight control that the ship had no pilot. Before Artoo was able to abort the takeoff, the StarSpeeder was accosted by a group of Imperial stormtroopers under the orders of Darth Vader. The Imperials revealed a Rebel spy was onboard and attempted to seize the ship. The spy’s capture was important enough to warrant the presence of multiple Star Destroyers, as well as the hiring of bounty hunter Boba Fett to track down the fugitive. Despite Threepio’s protestations, Artoo took control of the StarSpeeder and fled the hangar. The impulsive little droid fired on pursuing Imperial TIE Fighters, then jumped to hyperspace along a hastily-chosen route. Once the jump was complete, the ship almost crashed onto the nearest planet as the passengers hung on for dear life. After barely surviving a number of encounters on the planet’s surface, Artoo returned the ship to space. Once there, the StarSpeeder received a holographic message from a representative of the Rebel Alliance, explaining that the spy on board was vital to their cause and asked that the operative be returned to the coordinates provided. Once all on board agreed, Artoo flew the ship to the coordinates, where the spaceliner was attacked by enemy vessels. The brave astromech evaded the pursuers, and brought the StarSpeeder in for a safe, if somewhat rough, landing. Rebel agents at the landing site extended their thanks to the ship’s crew and passengers for delivering their comrade. Following the incident, the two droids were quietly returned to Captain Antilles. 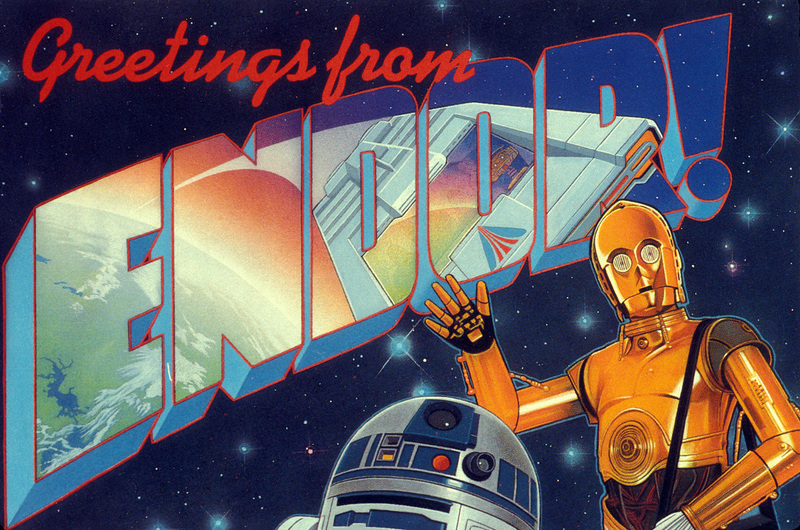 Star Tours was known to employ a large, random assortment of droids throughout its operation. The droid pool included astromechs, protocol droids, F series and G2 series repair droids, Mouse droids, and many others. These droids were often mismanaged, misused, and even acquired through questionable means. Two G2 droids in particular proved troublesome for Star Tours. The droids of the series (nicknamed “goose droids”) were known for having excessively sociable personalities hardwired into their circuitry. The quality was endearing to some small business owners, but large corporations found it unacceptable. G2-4T served as the Star Tours’ droid labor pool foreman, but he was given other tasks outside his intended programming, including handling ticketing, travel visas and security checks. His sarcastic personality and rude comments to passing customers often got him into trouble with his supervisors. Another goose droid, G2-9T, was bought second hand in a “pay-by-the-kilogram” fire sale. Though he was much friendlier to waiting passengers than G2-4T, his eagerness to engage them in conversation often distracted him from his work screening luggage. G2-9T was later returned to the repair work he was programmed for, but his spotty work record continued. Though Star Tours’ repair droids caused a number of petty annoyances for the travel agency, its pilot droids were a greater danger. The recklessness of one pilot droid led to disaster one year after the Rebel spy incident. Passengers on board the new Star Tours luxury yacht Tzarina were surprised when the vessel’s droid captain changed course toward the Yavin system to show them “something neat.” Soon after, the ship collided with what was later described as a strange TIE fighter, tumbling out of control. The jarring impact activated the Tzarina’s hyperdrive, sending the ship crashing into the surface of Dathomir and killing many passengers. Reports of the incident slowly came to light in the months that followed, passed on to spacers by an individual claiming to be the last survivor of the crash. Other less serious accidents were caused by pilots but they may have been more than freak occurrences, given Star Tours’ questionable use of certain droids. The agency kept the batch of defective RX-Series pilot droids delivered shortly before its re-launch instead of returning them to the manufacturer. Its own maintenance droids attempted to repair them.Much like the G2 droids, the RX pilots quickly developed personalities of their own when not subjected to memory wipes. The RX-Series was designed by Industrial Automaton and Reubens Robotic Systems to bridge the gap between astromech and protocol droids, and were known as reliable models that on rare occasion failed spectacularly. They could exhibit adventurous qualities that bordered on recklessness, like the RX who stranded its owner on Naboo after taking off in her brand new starship and setting course for the Outer Rim Territories without her. One inexperienced RX droid in particular would endanger his passengers on his very first flight for Star Tours. Following the decisive battle that resulted in the destruction of the second Death Star and the death of the Emperor, the remote Forest Moon of Endor was thrust into the spotlight. Hoping to capitalize on the moon’s sudden fame, Star Tours quickly introduced a daily flight known as the Endor Express a few months after the Battle of Endor. While the newly-established New Republic was fighting both the faltering Empire and the invading warlike Tof species, heroic droids C-3PO and R2-D2 found themselves temporarily working for Star Tours yet again. The duo mainly focused on maintaining the new StarSpeeder 3000s, but Artoo was assigned to serve as navigator onboard the maiden voyage of the Endor Express, designated Star Tours Flight 45 (ST-45). The pilot of the flight was inexperienced RX-Series droid RX-24, nicknamed “Rex.” The droid was part of the defective batch purchased by Star Tours years earlier, and repaired by the agency’s own repair crew. After a full complement of passengers boarded the StarSpeeder bound for Endor, Captain Rex botched the flight from the very beginning by taking a wrong turn through the maintenance bay. After a series of near-collisions, the ship safely left the spaceport and jumped to hyperspace. When the spaceliner finally dropped out of lightspeed, it sped past its destination and barely survived an encounter with a field of ice comets. Rex and the passengers’ moment of relief soon turned to panic when the StarSpeeder was suddenly seized by the tractor beam of an Imperial Star Destroyer. The ship was rescued by the pilots of the New Republic’s Red Squadron, who revealed that ST-45 had stumbled into a combat zone. The pilots attempted to protect the civilian craft from a wave of TIE fighters as they made their way to attack what appeared to be a third Death Star. Though the origins of the battle station remain unclear, it shared the fatal weakness of the first Death Star: an unprotected thermal exhaust port. Instead of fleeing the area immediately, RX-24 excitedly joined the X-wing fighters in a harrowing run down the trench leading to the exhaust port. After one of the X-wings scored a direct hit, the fighters and the StarSpeeder fled into hyperspace. Rex returned the passengers to the spaceport unharmed, but not before nearly colliding with a fuel carrier and skidding to an abrupt halt just short of a control room. Flight ST-45’s near-disaster would not be the first or last for Star Tours. Even subsequent trips to Endor were not immune, such as one flight that was attacked by Sanyssan Marauders on the forest moon’s surface. Several months after the Battle of Endor, accidents and mismanagement finally drove Star Tours out of business. The company’s assets were sold off, scattering its droids and starships throughout the galaxy. StarSpeeders continued to see use well into the era of the Yuuzhan Vong War. Goose droids G2-9T and G2-4T drifted between masters before eventually finding employment in the organization of smuggler and New Republic ally Talon Karrde. During the Caamasi Document Crisis — fifteen years after Star Tours’ demise — Luke Skywalker met with Karrde and brought along R2-D2. The droid spotted G2-9T and chatted with his former Star Tours colleague about old times. 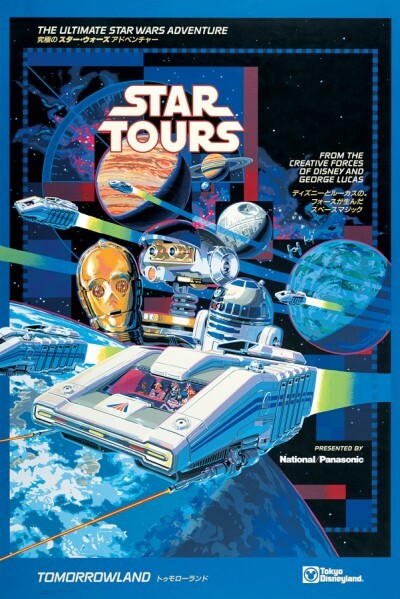 Star Tours was the first collaboration between Disney and Lucasfilm. In recent years, the Star Wars Weekends events have been held throughout the summer at Disney’s Hollywood Studios, bringing fans together with Star Wars actors and creators. 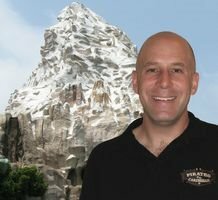 The two companies’ new partnership will bring fans Star Wars: Episode VII and beyond on movie screens soon, while the presence of Star Wars in the Disney theme parks promises to expand in the coming years, making Star Tours only the beginning. James McFadden has written more than a dozen articles for the United Kingdom’s Official Star Wars Fact File, as well as the article “The Forgotten War” for StarWars.com. In addition, James has contributed to a number of fan web sites. His first book, Fighting for Freedom: The Unauthorized G.I. Joe Chronology, is coming soon from Hasslein Books.